Property description: Portion 84 of the farm Doornkloof 391-IR. NB Projects Contact Persons: Nico Botha Tel (011) 678 4685. Current Notices: To view notices CLICK HERE. Property description: Part of the Remainder of Portion 2 of the farm Rietfontein 375-IR. Extent: Study area covers approximately 18.7621 ha in extent. Name of the proponent: Dwelling Developments (Pty) Ltd.
Bokamoso Contact Persons: Juanita De Beer or George Gericke Tel (012) 346 3810. LEAP Website: To view Website and Projects CLICK HERE. Bokamoso Contact Person: George Gericke, Tel (012) 346 3810. Current Notice: To view notices CLICK HERE. Earlier notices: Listed in this index under the same GAUTENG Ref Number. Previous Notices: To view notices CLICK HERE. Study area: Approximately 1249,1464ha in extent. Location: East of the R21, north of the R25, and west of the R60. Location Details: East of the proposed Twenty One Township 3 & North of the Serengeti Golf Estate. Current Notices: To view notice & PDF file CLICK HERE. Seedcracker Contact Person: Stephanie Webber 082-626-4117 or 012-346-3810. Two extra activities were added: To the proposed Sterkfontein Phase 1D (Gaut 002/09-10/N0570) project. Invitation to review the draft Basic Assessment Reports: For the proposed Sterkfontein 1B, 1C & 1D projects. Notification: Draft Environmental Impact Assessment(EIA) Report available for public review. Place & Dates: At Belverdere Guest House - Monday to Sunday: from 08:00 to 17 :00 hours. Project: Proposed Industrial and Commercial Development. Location: Portion 16 and 19 of the farm Sterkfontein 401 JR and on Gillimead Agricultural Holdings 1 to 16. Contact Persons: Stephanie Webber : Cell 082-626-4117 - Office 012-654-5970. Invitation to register and comment: On the proposed project. Current Notices: To view notice CLICK HERE. 3) Impact Assessment - Powerline and Substation Upgrades. Notices: To view all notices and maps CLICK HERE. At the Office building, Main gate of the Rietvlei Nature Reserve. Contact Person: Roelien du Plessis - Tel 084-584-4707 . Project description: Subdivision of Portion 70 of the Farm Doornkloof 391-JR.
Zitholele Consulting Contact Person: Anelle Lotter - 082 804 5890. Current Notice: To view notice CLICK HERE. Notices: To view CLICK HERE. Project descriptions: Special for access roads and access control, Retirement facilities, residential including ancillary uses, sport, recreational, community facilities, light industrial, manufacturing, workshops, distribution centers, transportation depots, warehousing and storage, offices and business buildings, restaurants, shop, showrooms and institutions. Place & Dates: At Belverdere Guest House from Monday, 08 February 2010 to Wednesday, 10 March 2010. Application for Environmental authorization: PROPOSED ESTABLISHMENT OF AN INDUSTRIAL AND COMMERCIAL DEVELOPMENT IN GILLIMEAD. Property description: Portion 159 of the farm Doornkloof 391 JR. Extent: 9 erven to be zoned in terms of the Peri-Urban Area Town Planning Scheme, 1975. Application for Environmental authorization: Proposed Industrial and Commercial development. Applicant: Urban Dynamics Inc. Appointed SEF as an independent environmental consultant. Location: Portion 102 of the Farm Doornkloof 391 JR in Gilliemead. SEF Contact Persons: Khomotjo Kwenaite at Tel: (012) 349 1307. Mills and Otten Contact Person: Kirstin Otten (Pr.Sci.Nat. ), Tel (011) 486 0062. Proposed Changes: 1) Visual & Noise Screening Recomendations 2) Buffer Area around the Bakwenacave. Location: East of Glen Ave (West of M57), South West of the Rietvlei Nature Reserve and North of Clayville. .
Property description: Portions of Farms - Olifantsfontein 402-JR, Olifantsfontein 410-JR, Sterkfontein 401-JR.
NB: This final report included the comments and objections received from registered parties, following the review of the draft Scoping Report. The appendices are not attached. Earlier notices: Listed in this index under the same GAUTENG Ref Nos. 2) The 5 O'Clock access and Interchange project. Previous notices: Listed in this index under the same GAUTENG Ref Nos. Positive ROD Received: For Subdivision of land. Application for Environmental Authorization: Rietvlei Development on Witkoppies portion 28. Background Information - Activities: 1) Subdivision of land. 2) The construction of a road. Current and Previous Notices: To view notices CLICK HERE. Location: Between K109 and R21 Albertina Sisulu Freeway. Extent: The study area covers approximately 1371 ha in extent. Name of the proponent: JR 209 Investments (Pty) Ltd. Location: East of Clayville, East of the R21, South of the Rietvlei Nature Reserve and almost directly west of the Delmas Road (R50). Extent: The study area covers approximately 1295 ha in extent. Location: East of Clayville, directly East of the R21 and South of the Rietvlei Nature Reserve. Background: The public right-of-way over Doornkloof 391-JR private properties, known as "Sterkfontien Avenue", was extended into road D2382 by Gautrans. This extension has resulted in, non-residential, traffic from the south making use of "Sterkfontien Avenue". Most of the dust problem, and the high rate of accidents, on this road are the result of the "non-residential" traffic build up on "Sterkfontien Avenue". Letters and Photographs: To view CLICK HERE. 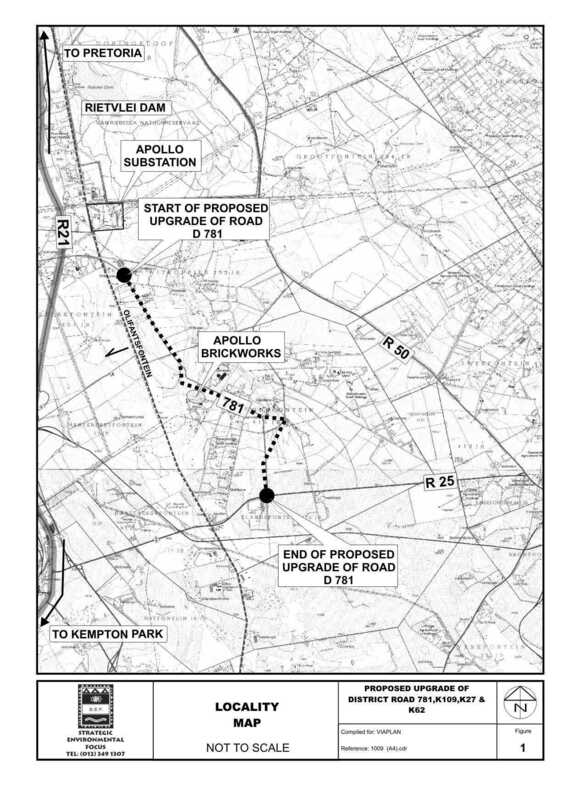 Application for Environmental Authorization: Proposed Road K220 EAST. Note : An extra activity (1m) was added to the previously listed activities. Property description: Portions of Farms - Sterkfontein 401 JR, Witkoppies 393 JR, Grootfontein 394 JR.
Current Notice - October 2008: DOWNLOAD PDF FILE. Notice: Apollo Station Upgrade - Progress Report. Zitholele Consulting Contact Person: Anelle Odendal, Tel (011) 254-4855 or 082-804-5890. Previous Notice - May 2007: To view notice CLICK HERE. Current Notice - September 2008: To view notice CLICK HERE. Notice: Appeal against negative ROD. Location: Portion 1 of the Farm Witkoppies 393-JR.
Notice of Appeal: DOWNLOAD PDF FILE. Application for Environmental Authorization: Proposed establishment of a retail development. Location: Part of Portion 1 of the Farm Witkoppies 393-JR.
Current Notice: DOWNLOAD PDF FILE. Current MDB Circular: DOWNLOAD PDF FILE. Current MDB Press Statement: DOWNLOAD PDF FILE. 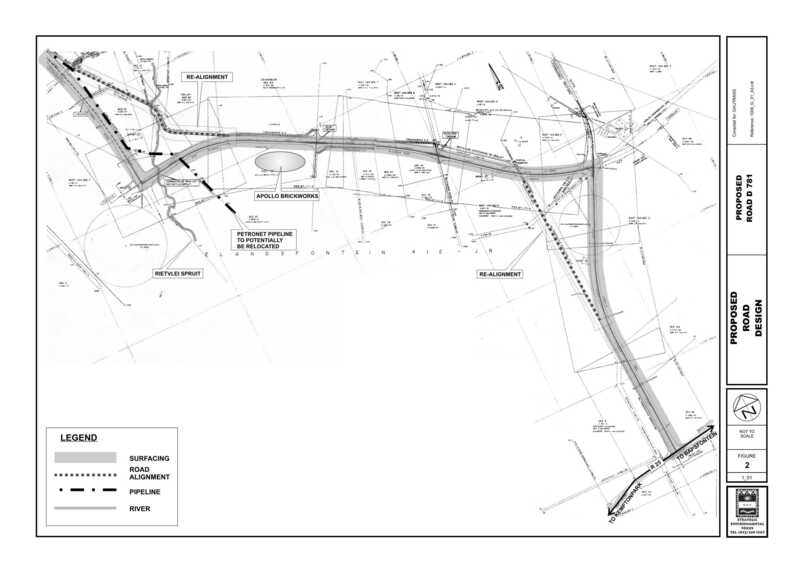 Project description:Detail Design and Construction Expressway South. "According to this notice, a small part of the Metsweding District Municipality will be incorporated into Ekurhuleni." The above "small part" includes the DKOA section of the farm Doornkloof 391JR. Action Needed: Property Owners have until the end of June to lodge objections. BACKGROUND: This notice replaces the MDB notice copied below. BACKGROUND: The Board: resolved to allow until 31 December 2007 for Gauteng to submit proposals; approved that, if no proposals were received by then, the Board takes the initiative in terms of section 22; approved that a section 26 notice be published; determined 15 February 2008 as closing date for the submission of views and representation in terms of section 26. MDB RESOLUTION: Re-determination of municipal boundaries by excluding several farms east of the Tshwane, including the farms Zwartkoppies,Tweefontein, Bashewa, Tigertpoort; Rietfontein, Grootfontein, Zwavelpoort, Mooiplaats, portion of Donkerhoek, Witkoppies, Sterkfontein portion of Rensburg and portion of Doornkloof farms to the east of the Tshwane from Kungwini (GT462) / Metsweding, and by including them into Tshwane Metropolitan municipality (TSH). Public meeting: Regarding the proposed K 220 development - Will be held on 3 June 2008 at the St. George Hotel. Application for Environmental Authorization: Proposed Road K220 development. Location: Between the K109 to the west and the R21 to the east . Property description: Portions of Farms - Sterkfontein 401-JR, Olifantsfontein 410-JR, Olifantsfontein 402-JR.
ROD for the Scoping Report: DOWNLOAD PDF FILE. Location: Also know as 5 O'clock Properties - Doornkloof 391-JR_P335 & P198 - 277 hectares in extent. Name of the proponent: M&T Development (Pty) Ltd. Application for Environmental Authorization: 5 O'clock (Road) Access and Interchange. Location: Parallel to Botha Road and west to south west of the Pierre van Ryneveld. Location: The site for the proposed development is situated between the N1Freeway and Nelson Road. Activities: Residential Units, Offices, Shops, Service Industries, Medical Suites, Restaurants, etc. Draft Environmental Scoping Report: HIGH-PRESSURE TRANSMISSION GAS PIPELINE. Background Information: GAS PIPELINE FROM SPRINGS TO VASTFONTEIN. Map & Additional Information: DOWNLOAD PDF FILE. EIA Phase: Rietvlei Development on Witkoppies portion 1 - EIA phase. Background Information: Proposed 'Rietvlei' township development - EIA Phase. Scoping Report: K54 Scoping Report for Review - Available at the Rietvlei Game Reserve Main Gate Reception. Proposed Development: 'Rietvlei Business 4' (Rietvlei X2) on the Remainder of Portion 5 Doornkloof 391JR. Special Notice: The above proposed development has received a positive ROD. Application for Environmental authorization: Proposed Development of Portions 81, 82 & 83 of the Farm Doornkloof 391-JR. Project description: Residential Estate. Approximately 400 Units. Back Ground Information: DOWNLOAD PDF FILE. Application for Environmental authorization: Proposed Development of Portion 70 of the Farm Doornkloof 391-JR. Project description: Commercial and quasi industrial rights including offices and retail. Bokamoso Contact Person: Philip Beukes, Tel (012) 346 3810. DOWNLOAD APPEAL PDF FILE. Application for Environmental authorization: Public Meeting - Proposed subdivision - Part of the Remaining Portion of the Farm Doornkloof 391-JR. Location: A strip of land between Sterkfontein Avenue and the R21 Freeway. Bokamoso Notice - Public Meeting Sterkfontein Roads: PROPOSED ROADS: Expressway South, Expressway North, Engen Interchange, Clive Road, Kudu Subway Under R21, K220 between the K109 and R21. Location: Sterkfontien area. Application: For Prospecting Rights for Clay, Ball Clay, Aggeregate and Sand. Location: On portions 15, 41 and 113 of Farm Doornkloof 391-JR. Contact Person: Mr J Human Tel: 012-667-1919 Fax: 012-667-1828 Cell: 082-778-8297. To View the notice: CLICK HERE. To register as an Interested and Affected Party (I&AP) : DOWNLOAD PDF FILE. Application for Environmental authorization: PROPOSED ROADS: Expressway South, Expressway North, Engen Interchange, Clive Road, Kudu Subway Under R21, K220 between the K109 and R21. Location: Sterkfontien area. Application for Environmental authorization: Installation of External Services (sewage, stormwater and water system) for the proposed Rietvlei Developments Location: Farm Doornkloof 391-JR. Application for Environmental authorization: FOR THE ESTABLISHMENT OF AN OFFICE PARK AND MINI SHOPPING CENTRE AS WELL AS A FIILLING STATION ON PORTION 60 AND 58 OF FARM DOORNKLOOF 391 JR. Application for Environmental authorization: Proposed pipeline for water supply to the existing reservoir in Pierre van Ryneveld. Location: East of R21, south of Waterkloof Agricultural Holdings on Part of Portion 131 of the Farm Doornkloof 391-JR. Application for Environmental authorization : Proposed Highveld X66 Development. Motor related industries, Restaurants, Confectionaries. Location: North of Route K54 (Nellmapius Drive) and south of the Highveld Technopark. Application for Environmental authorization : Proposed Reservoir on part of the remainder of Portion 62 of the farm Rietfontein 375-JR. Invitation to register as Interested and Affected Parties (I&APs). Application for Environmental authorization : Proposed township establishment on Portion 1 of the Farm Witkoppies 393JR. Invitation to review the scoping report. FOR THE PROPOSED SUBDIVISION OF PORTION 20 OF THE FARM GROOTFONTEIN 349JR, PRETORIA, GAUTENG. Application for Environmental authorization : Proposed township establishment on Portion 1 of the Farm Witkoppies 393JR. CONSENT USE: PORTION 184 (A PORTION OF PORTION 57) OF THE FARM DOORNKLOOF 391JR. Public Open Week: 20th-27th August at Rietvlei Main Gate. Proposed Development 'Rietvlei Business 4' - Rem of Port 5 Doornkloof 391JR. 1) Public Notice - Invitation to view Scoping Report. Regarding the proposed developments on Portions 107 Doornkloof 391JR. 2) Public Notice - Invitation to the Public Meeting. Regarding the proposed developments on Portions 107 & 129 Doornkloof 391JR. Public Notice - Invitation to the Public Meeting. Regarding the Construction of a section of Road K54 to the west of the Rietvlei Dam. Public Notice - Proposed development on Portion 129 of the Farm Doornkoof 391-JR. Note: The above GDACE 'Closure Letter' dated 061102 was addressed to Bokamoso with copies to the City of Tshwane Metropolitan Municipality (CTMM), the Gauteng Conservancy Association (GCA) and the National Association of Conservancies of South Africa (NACSA). The letter was sent as a follow-up to the DACE letter of December 2005. Please see the TimeLine entry dated 051213. Important Notice: The above NOTICES OF PROPOSED EXEMPTION FROM THE ENVIRONMENTAL IMPACT ASSESSMENT REGULATIONS have been placed on site for a period of 30 days from Wednesday 08 November 2006. Contact Persons: Stefan Frylinck & Associates, Town and Regional Planning - Mpofu Environmental Consulting CC, Environmental Assessment Practitioners: P.O. Box 77449, ELDO GLEN, 0171. Tel: (012) 658-0392 Fax: (012) 658-0413 Cell: (082) 785-2068 E-mail: planprop@lantic.net. Bokamoso Notice: Second Public Meeting for the Proposed Road 2382. Please find attached an invitation to the Second Public Meeting for the Proposed Road 2382. Bokamoso has released to the I&APs the GDACE Review of the ROAD D2382 Scoping Report dated December 12th, 2005. The Gauteng Provincial Government Department of Agricultural, Conservation and Environment (GDACE) has highlighted the following: 1) Alternative road alignments to be investigated. 2) Additional environmental concerns to be addressed. 3) Need for further public participation and public meetings. Public notice regarding the proposed development on the Portion 107 of the Farm Doornkoof 391-JR.
PUBLIC OPEN WEEK: Rietvlei development (Portion 1 of the Farm Witkoppies 393JR). All interested and affected parties are invited to the Public Open Week to review the Draft Scoping Report of the proposed Rietvlei development (Portion 1 of the Farm Witkoppies 393JR) and to register any issues and concerns to be included and addressed in the final Scoping Report. Bokamoso CC was appointed by Chieftain Construction Limited to obtain authorization in terms of the Section 22 of the Environment Conservation Act, 1989 (Act 73 of 1989) in order to commence with"Grootfontein Development" a proposed township on Portions 1 and 8 of the farm Grootfontein 394-JR.
Bokamoso CC was appointed by Chieftain Construction Limited to obtain authorization in terms of the Section 22 of the Environment Conservation Act, 1989 (Act 73 of 1989) in order to commence with the township establishment of Rietvlei on Portion 1 of the farm Witkoppies 393-JR.
BOKAMOSO NOTICE: Notice of the township establishment - "Junction 21 (Phase 1) - on the Remainder of Portion 13 of the farm Sterkfontein 401 JR. Please find: 1. Find the Notice attached to this email (CLICK HERE) 2. Public Open Week to review the development information regarding the Sterkfontein development - Junction 21. Registration and documents for inspection at Olifantsfontein Library, Pearse Road. Date: 15 May - 15 June. ACE of WASTE is now providing a rubbish removal service in our area. Application forms can be downloaded at this site CLICK HERE: Contact BERNARD MEW 084 911 9111 for further details. BOKAMOSO NOTICE: Notice of the township establishment - "Junction 21 (Phase 1) - on the Remainder of Portion 13 of the farm Sterkfontein 401 JR. Please find: 1. Find the Notice attached to this email (CLICK HERE) 2.We would like to invite you for a Public Meeting regarding the Sterkfontein development - Junction 21 which will be held in the Olifantsfontein Community Center on 21 February 2006 at 18h00. The Department of Water Affairs and Forestry (DWAF) recently completed the Internal Strategic Perspective (ISP) study for, amongst others, the Crocodile (West) River catchment. Meetings are scheduled as follows: 10:00 on 26 July 2005, Centurion City Hall, Centurion - 10:00 on 27 July 2005, Civic Centre, Rustenburg - 10:00 on 28 July 2005, Show Grounds Hall, Thabazimbi. Bokamoso Notice: (received 16 December, 2004) : Authorisation denied for proposed Rietvlei Phase 1 & 2 Township Developments. Reasons for denial: Existing policies, Geotechnical conditions, Possible habitat for red data fauna species, Buffer Zone around the Rietvlei Dam Nature Urban Edge, Fragmentation of habitat, Urban sprawl, Agricultural potential. Illegal construction on site. WARD COMMITTEES 'Will Help Empower Local Communities': The Municipal Structures Act provides for the political and administrative authorities of every municipality to create ward committees with tasks including the preparation, implementation and review of integrated development plans and the review of a municipality's performance management systems. Provincial and Local Government Minister Sydney Mufamadi says there are better ways to ensure public participation in local government than have recently been experienced in places such as Harrismith, Phomolong, Kungwini and Westonaria, where residents went on the rampage after protesting about poor service delivery by municipalities. ESKOM - MUNICIPAL MERGERS ON TRACK (REDS): The merger of Eskom's seven distribution network businesses with the 187 licensed municipalities is on track, says Electricity Distribution Industry Holdings (EDI). The first of SA's six regional electricity distributors (Reds) will be launched in June 2005. RATES - City of Cape Town - Constitutional Court's decision "The highest court in the country has not only confirmed that the city's legal basis for determining rates is valid, but has also confirmed that the city's authority to impose property rates flows from the constitution itself." GAUTENG SMALL TOWNS MAY BECOME SUPER CITY: With the approval of the Demarcation Board, the ANC plan would see an end to districts such as the West Rand; Sedibeng and Motsweding and municipalities including Merafong, Mogale City, Westonaria, Randfontein, Midvaal, Emfuleni, Lesedi, Kungwini and Nokeng Tsa Taemane. The above document was tabled at the Bronberg Land Development Objective (LDO) meetings. The authors of the Bronberg Integrated Development Framework document dated JULY 2000 took cognisance of the above recommendations and make specific reference to the area around the the Rietvlei Game Reserve. The Rietvlei Game Reserve is made up of the farms Rietvallei 377-JR and Witkoppies 393-JR. The farms Doornkloof 391-JR, Rietfontein 375-JR and Grootfontein 394-JR border on the Reserve. The main purpose of the N1/R21 EMF and the BRONBERG EMF is to pro-actively identify areas of potential conflict between development proposals and critical/sensitive environments. In particular see the files headed Policy.pdf and the Minutes of the Final Stake Holders Meeting.pdf dated 17 March 2004. List of Weeds and Alien Invader Plants AND the Regulations pertaining to the Conservation of Agricultural Resources Act 43 of 1983 as amended. GDACE (DACEL): Media Statement by Mr. Khabisi Mosunkutu, Gauteng's MEC for Agriculture, Conservation and Environment, on the Implementation Programme of the National Environment Management Second Amendment Act, Act No 8 of 2004, which came into force on the 7th January 2005. ".... The Gloves are now off - Apart from providing more stringent mechanisms for enforcing environmental legislation and penalizing none compliance, this Act gives the wrongdoers a window period of six months to rectify their activities and comply. The Act stipulates that unauthorized commencement or continuation with activities identified in terms of Environment Impact Assessment (EIA) Regulations, unless rectified by an application and endorsement by the relevant MEC, now face penalties of up to R5 million and or 10 years jail term...."
A very useful list of Projects and Products - the list may not be up-to-date. The earliest historical writings of the period record that the Bakwena tribe, known as the Crocodile people, lived in the area in the early 1800's. When Mzilikazi (whose people became known as the Matabele) came to the area in 1825, he killed many of the Crocodile people and drove the rest away. One of the Boer Voortrekkers, Daniel Elardus Erasmus, who left the Cape Colony in the 1830's to seek economic and political independence in the hinterland, settled in the area on a farm that became known as Doornkloof. Doornkloof became known as the "kerkplaas" of the district. When Daniel died in 1875 he left the farm to his three sons. A PLANT ECOLOGICAL STUDY OF THE RIETVLEI NATURE RESERVE GAUTENG PROVINCE By RIAAN MARAIS. Submitted in fulfilment of the requirements for the degree Magister Agriculturae (Wildlife Management) In the Faculty of Natural & Agricultural Sciences Department of Animal, Wildlife and Grassland Sciences University of the Free State Bloemfontein South Africa Promoter: Prof. G. N. Smit Co-promoter: Dr. P. J. du Preez November 2004. Rietvlei Dam Nature Reserve - Hiking, Birding, Fishing, Horse Riding & Game Viewing. The Rietvlei dam was built during the great depression and was completed in 1934. Feeding the dam is the Sesmyl (Six Mile) Spruit, five fountains and five boreholes. Upstream from Rietvlei dam is the Marais Dam which acts as a sludge dam for Rietvlei Dam.